When it comes to car seats for baby, choosing a good one doesn’t only require looking at which brand or model performs well or seats comfortably. In fact, the most important aspect of these products is being able to fit them in your vehicle. The best convertible car seat for small car owners can sometimes be tricky to find. For the most part infant car seats are bulky as they are. Plus, manufacturers have to ensure that they put enough protection not only for body support but also around the seating area to make sure that baby doesn’t absorb the impact of the car ride. This adds to the size of their seats. If you own a compact or mid-sized vehicle that has issues with fitting standard convertible car seats, we have a list of products for you to consider. For each of our picks below, we’ve included the width and depth of the seats, plus the height so you can estimate if they can fit into your car. Best Convertible Car Seat for Small Car Use: When it comes to safety and being able to fit into compact vehicles this is our top pick. The unit surrounds your child with protective layers to keep them safe at all times. It comes with a narrow 17” width from side to side to help allow it to fit into smaller interiors. Its low sitting profile also makes it fit into cars with low ceilings. This also makes it easy for you to put baby into the vehicle as well. This is a car seat that allows you to have it rear facing during the early years then convert into a front facing seat as they grow bigger. Later on, it transforms again, this time to a booster seat. Rear facing: for children between 5 lbs. and 45 lbs. Front facing: for kids between 20 lbs. and 80 lbs. Booster seat: until 120 lbs. This seat comes with EPS foam that’s designed to absorb energy from any impact to give baby that extra measure of safety. It also has memory foam cushioning as well as body support for comfort. The Radian RXT has been crash tested by the New Car Assessment Program (NCAP) to verify seat performance safety for young children. One extra cool feature of this seat is that it can fold up to a compact form and attach to a strap so you can carry it on your back like a backpack. You do need to purchase the carry strap separately though. Slightly wider and deeper, this gives baby more room to sit on but also takes up a bit more space in the back row. Depending on the type of car you have this may be a good option as it still takes up a small amount of space. One thing to note though is that while it is bigger in footprint compared to the Radian RXT above, it has a slightly lower height and weighs a lot less. This unit is equipped with a 5 point harness, this convertible car seat gives baby an 11” by 11” seating area. It offers a good amount of padding to keep baby safe. An impact stabilizing frame which is what the foam and fabrics rest on. On the sides, it is equipped with complete side impact protection which keeps your baby’s neck and head extra protected in case of any impact. At the bottom, it uses an impact absorbing base. 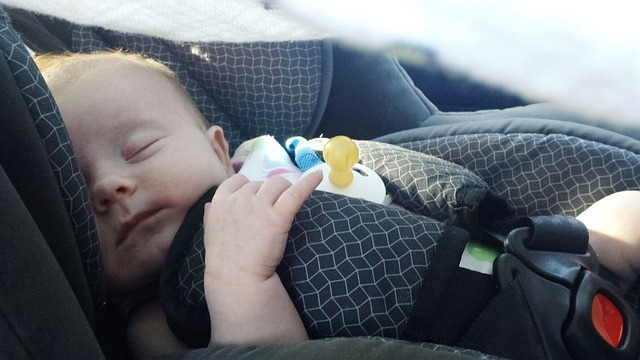 The extra padding, dense foam and protective layers are what make this baby seat among the top picks in our best convertible car seat for small cars review. As parents, child safety is also the priority above all else. We love that the manufacturer went above and beyond the safety standards to ensure baby is protected and safe. Rear facing: for children 5 lbs. to 40 lbs. Front facing: for children between: 20 lbs. to 55 lbs. FAA Certified Baby Car Seat (for use in airplanes): This is another product from Diono. When it comes to reliable convertible car seats for small vehicles this is a brand we like. Compared to the Radio RXT, this has a slightly lower capacity. It offers the same rear to front facing convertible feature as well as the ability to transform into a booster seat later on. However, it maxes out at 100 lbs. for the booster seat. As with the Radian RXT, it uses a full steel frame that’s also reinforced by aluminum. This is one reason why it is heavier than many of the similar seats in its class. The use of steel, while heavier does add that extra safety. This unit is also designed to fit 3 of them in the back row of most mid-sized cars. And like the other Diono seat above, it is FAA certified. This lets you bring it with you and use for baby on flights as it has the Federal Aviation Associations approval for use in airplanes. This is something that not all seat have. To do so, just fold it till it becomes fully flat. You can of course get the extra carry strap to make carrying more convenient. Easy to install: This convertible car seat is specifically designed to fit smaller cars. It also comes with the ability of being able to be installed to your vehicle without having to use a base. This makes it easier to set up. The unit uses 2 latches at the bottom and another one at the top section when used in the front facing position. The unit’s size allows you to use this in a small car or transfer it to save space on a larger vehicle. With regular sized vehicles, you can fit 3 of them in the back row. This gives you an idea of how much space each one takes up. These are 2 features that make it different from the other convertible car seats. It uses premium fabrics that are both soft and supportive. It is also equipped with side impact protection to help ensure baby’s safety throughout the ride. Rear facing: for kids between 5 lbs. to 40 lbs. Front facing: for kids between 22 lbs. and 65 lbs. Taking care of baby is top priority for any parent. And using a good convertible car seat is the best way to keep them safe when riding on a vehicle. The products above are best suited for small cars or mid-sized vehicles with small interiors.